The purpose of this paper is to draw particular attention to the recent disparity in crude oil prices – namely the difference between two benchmarks - West Texas Intermediate [WTI] and Brent [North Sea] Crude. Historically the price of WTI trades at a premium to lesser quality Brent North Sea Crude. This paper lays out the case that the extreme, existing, observable price discrepancies is likely the result of engineered and arbitrary market manipulations – to be discussed below. Such arbitrary price manipulations in the oil markets impact negatively on the oil exporting economies and show favor to oil importing economies. Earlier this month, the world’s largest oil producer set the table for a move away from traditional light, sweet crude oil. Saudi Aramco, the state-owned company of Saudi Arabia has decided to drop West Texas Intermediate (NYMEX: WTI) as the basis for pricing its oil sold to the U.S. market. The Saudis priced off WTI for 15 years. In its place, Saudi Aramco will start using the Argus Sour Crude Index (ASCI), which measures heavier oil with higher sulfur content. Traditionally, heavy, sour crude is cheaper than WTI. Heavy crude requires extra processing at the refinery to remove impurities, which is why it’s discounted. WTI, which measures onshore light, sweet crude in Texas. Brent, which measures light, sweet crude on the north shore of Europe. ……After Saudi Aramco announcement, Venezuelan president Hugo Chavez said his country would follow its lead in using ASCI as the benchmark crude import to the United States. Argus Crude futures and Brent North Sea Crude futures both trade on the Intercontinental Exchange [ICE] – which is London based and not nearly as American biased / influenced as West Texas Intermediate [WTI] which is the underlying commodity of New York Mercantile Exchange's oil futures contracts. Essentially, the difference between the two pricing regimes is that ICE is European [World] centric while the WTI is more reflective of “made in America pricing”. Saudi Arabia and Venezuela are predominantly selling the U.S. lower grade SOUR CRUDE – at the aforementioned elevated price which is a stiff premium to WTI. By extension, they are likely selling their higher grade sweet crude to OTHER NATIONS [like China, Europe] at the MUCH HIGHER Brent Benchmark price. The output of Canada’s oil industry is being sold at a discounted benchmark price relative to what other major oil producers are receiving. This – at least in part - explains why Canada’s Current Account [Trade] surplus has narrowed so much [and gone into deficit] in recent years. We suspect this is the REAL REASON why many of the world’s oil producers went off the WTI benchmark – it appears to be “arbitrarily discounted”. Canada, and perhaps Mexico, by using this discounted price - are receiving LESS. This is compromising their trade balances and hence their national finances. Remember folks, TRADE DEFICITS DESTROYED AMERICA as much or more than their budget deficit. Canada today is [conservatively] receiving $10.00 per barrel LESS than it should be. 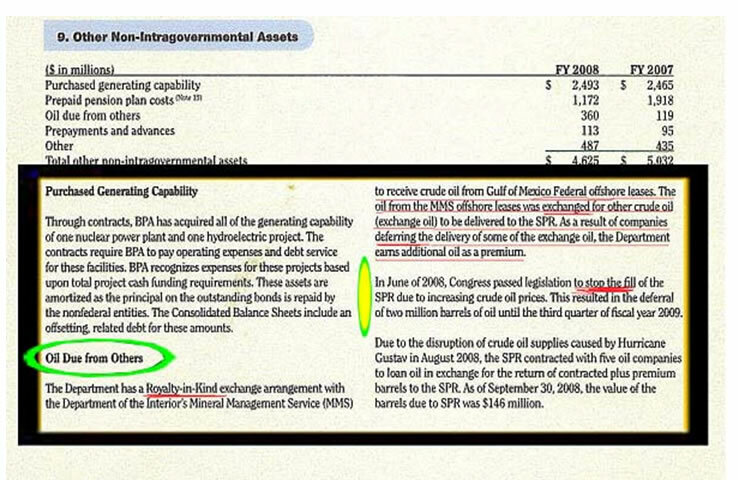 10.00 per barrel x 2.5 million per day = 25 mill per day or 750 million per month or 9 billion / yr. – just for crude oil. Domestic crude accounts for only about 45% of Canada's oil consumption. Imports represented the remaining 55%, mostly coming from either North Sea countries or the Middle East. 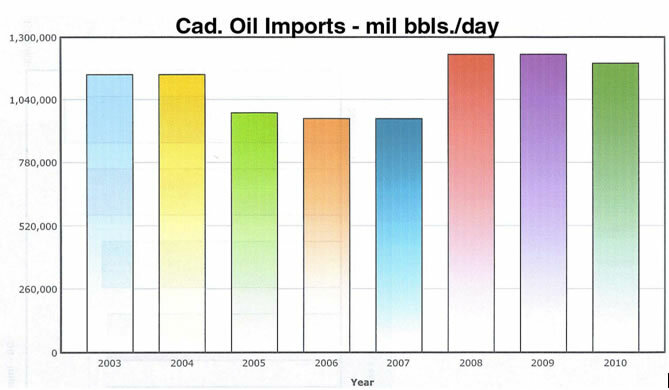 Imported oil feeds refineries mostly in Eastern Canada. So, Canada’s trade picture is actually getting a “double whammy” - Exporting CHEAP, UNDERPRICED HIGH-GRADE crude to the U.S. and Importing more EXPENSIVE LESSER-GRADES from Europe and the Middle East [to the tune of losing an additional 10 bucks per barrel on another 1.1 million barrels per day]. In economic parlance this is called “buying high” and “selling low” or a great recipe for ‘going broke’. No wonder Canada’s trade picture has soured so much. The notion that Nat. Gas is purely a “regional market” and North America is ‘awash’ in natural gas to explain the price disparity between North American and European product is “disingenuous gibberish”. The world's largest proven gas reserves are located in Russia, with 4.757×1013 m³ (1.68×1015 cubic feet). With the Gazprom company, Russia is frequently the world's largest natural gas extractor. Major proven resources (in billion cubic meters) are world 175,400 (2006), Russia 47,570 (2006), Iran 26,370 (2006), Qatar 25,790 (2007), Saudi Arabia 6,568 (2006) and United Arab Emirates 5,823 (2006). It is estimated that there are also about 900 trillion cubic meters of "unconventional" gas such as shale gas, of which 180 trillion may be recoverable. The natural gas price in North America is determined by the “paper trade” in the same way that precious metals prices are determined by the sales of a hundred ounces for every physical ounce in inventory. More specifically, the price of Nat. Gas in North America has been determined on the trading desk of J.P. Morgan Chase since Jan. 2006 when J.P. Morgan entered the Nat. Gas futures trading arena to ‘exterminate” and take the other side of their ‘serial long’ customer – Amaranth’s trades. This is extensively documented in a 2007 treatise titled, Derivatives Disaster: Deriving The Truth. 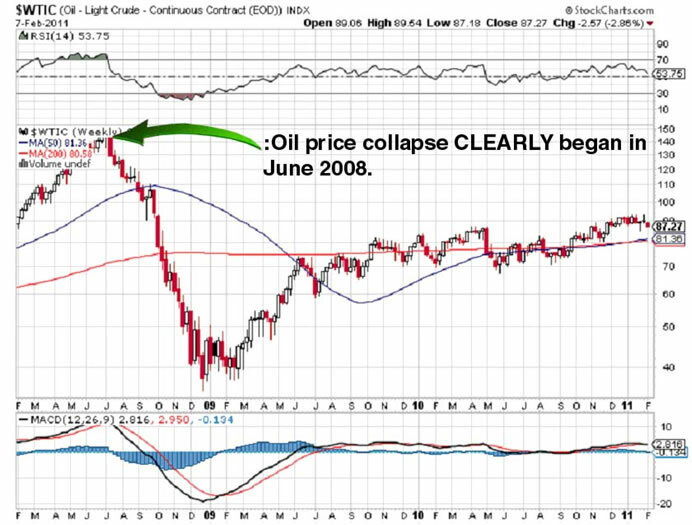 Notice the demarcation point [from mid-2008] when America began “rigging” energy prices in earnest – something documented back in early 2009 in a treatise titled, Oh Yes They Did! When Hurricanes Gustav and Ike struck the Gulf Coast in September 2008, they impacted oil production, refining, and distribution operations that led to shortages of both crude oil and refined products. The Secretary of Energy utilized the authority of section 161(g)(1) of the Energy Policy and Conservation Act (EPCA) (42 U.S.C. 6241(g)(1)) to authorize the test of Strategic Petroleum Reserve response capabilities through limited test exchange contracts that would release emergency crude oil to refiners and help mitigate the severe regional supply disruption. This only lends more credence to the work of those like John Williams of Shadowstats.com who point out how corrupt and misleading official inflation data really is. This is the true state of our capital markets, folks. The balance of this article is for subscribers only. Subscribe here. Copyright © 2010 Rob Kirby - All rights reserved.